All the Elaeagnus family bear edible fruits as well as being useful nitrogen-fixing plants for hedges etc. The evergreens grow well in sun or shade. 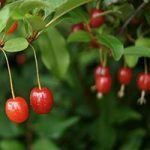 The fruits are currant to cherry sized and astringent until fully ripe. Our favourite is the autumn olive, E.umbellata, which fruits abundantly in hedges.